Memorial markers, once called tombstones, are essentially masonry items. I visited a granite mill while I was photographing stone cutting for my book, Simple Stonescaping. 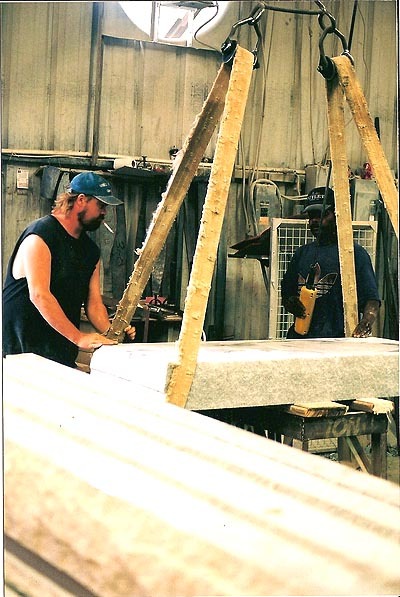 The basic shape for a tombstone starts with a piece of granite that is twelve feet long by six feet thick by six feet high. These huge pieces are removed from the earth by cranes, but are first cut by drilling holes with a long acetylene torch, then separated by a three part wedge -two steel sheathes and a tapered pin about six inches long. Colloquially know as feathers and wedges, these tools spaced a foot or so apart will, when driven in by a sledgehammer, cleave a huge piece of living stone from the earth. The granite from Elberton, Georgia (an hour northeast from Atlanta) is prized world wide for memorial stock due to its small grains and lack of veins. Clear stone as it is called. Granite, an igneous rock, is composed of feldspar, quartz, and black and white mica, is formed underground by slow cooling lava, or magma as it is known geologically. Granite close by in downtown Atlanta is metamorphosed, compressed under pressure from the moving earth, into gneiss (pronounced nice) and is twisted and full of veins (called pegmatite dykes) and is only good for gravel or ballast, because it cleaves in unpredictable ways and, though hard, is a virtually unworkable stone for a builder. Gravel and ballast are quarried with dynamite and referred to as blast stone. 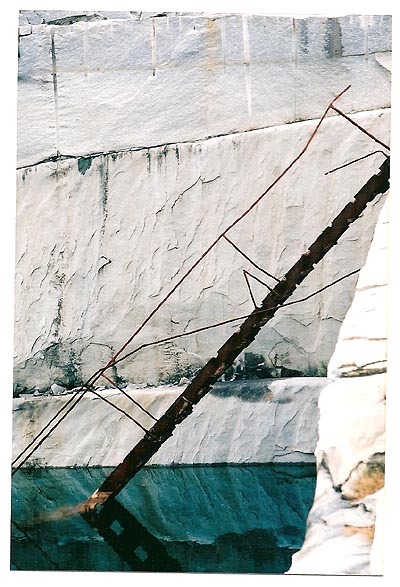 After the stone is lifted from the quarry pit, a man walks around the cubic stock and grades it – "A" for memorials, "B" for building stone and "C," which goes down in another pit for fill to be covered by dirt in land reclamation. A huge amount of quarried granite is discarded, being too expensive to process further. 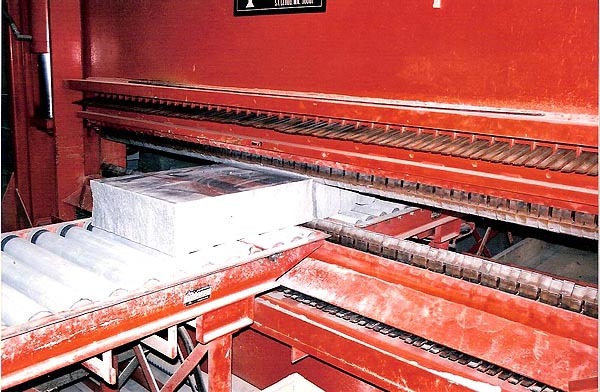 The "A" stone is sent to the mill by truck where slabs are cut with a saw (picture right) with a twelve-foot diameter blade and industrial manufactured diamonds impregnated on the edges. It is more like a thin grinding wheel than a blade with teeth for cutting wood. Water constantly pours on the blade to cool it. 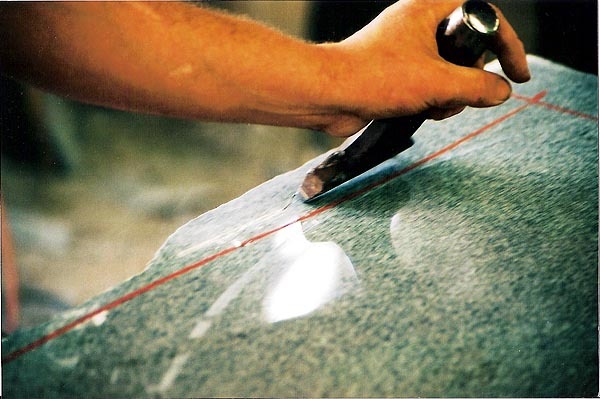 The slabs are then sent to a machine with grinding wheels where the surface is honed flat to remove the saw blade marks and, with ever finer grinding wheels, is polished to a lapidary finish that is reflective. 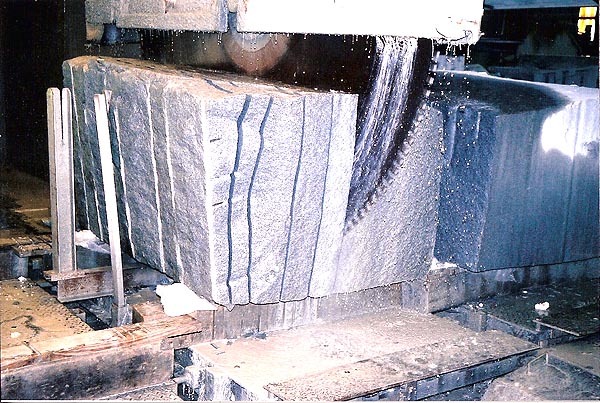 In large mills, a guillotine (picture right) with dozens of chisel points pinches the stone hydraulically to produce "chisel faced" edges and size the rough dimension of the memorial. After being polished then sized with the guillotine, slabs are lifted with a chain hoist hooked to thick canvas webbing (picture) and lowered onto the cutters table. He adheres a metal template to the slab with suction cups and marks a line with a red crayon, then, an inch or so outside the marked line, he chisels the stone away using a six pound hammer and a four inch wide chisel called a set. In less than a minute the removes the excess stone with just a few full strokes (picture). Then he follows the red line carefully with the chisel and a crisp, sharp edge emerges. This is called pitching the edge and provides a beveled shape to the parameter of the profile of the slab. Caught in the right light the cups and ridges of the side of the stone looks like clouds billowing. The lettering was, for eons, done with smaller chisels, one inch wide at most, some coming to a point like a pencil. Now a rubber mat of lettering stencils is placed on the stone and the letters are sand blasted and epoxy paint fills the depressions made by the sand blasting. Pictures are sometimes carved with an electric engraving tool onto the polished surface, and the contrast of polished and mat finishes of the etched lines reads to be depth and fading perspective. 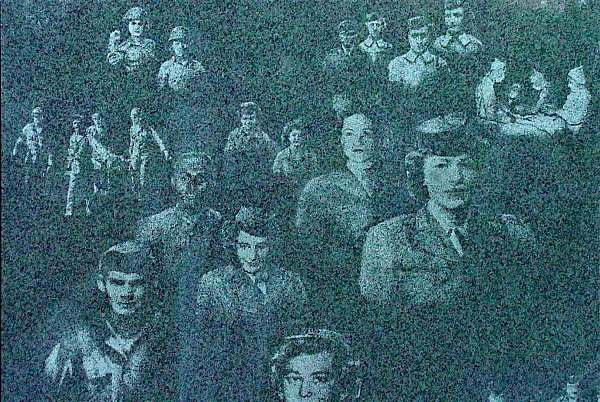 Incredible accuracy can be drawn by a skilled artist like depictions of the soldiers faces at the Korean War Memorial in DC (pictured), some appearing near, some distant captured in black granite. Figures, such as a lamb for a child's grave, are carved in granite with a small diamond blade on a grinder. Mausoleums are rare but have always been expensive. It is one of the few places you find stone roofs. There may be only a hundred stones in a mausoleum, cubic stock that is two feet thick for the walls, set in place by a fork lift, rested on wedges (once wooden, now neoprene) and the joints filled with cement squeezed between the stones with a grout bag. A mason I know was on a three-man crew and put one together in three days. The grieving client paid sixty grand for the house of remains. The stone mill charged about twenty grand for the stock, the installers made about two grand in wages, and the contractor pocketed the rest. It was a good week. Stone is stubborn - hard to move, hard to shape and work, and it's always a triumph of will to achieve the end result. Some people walk through a graveyard and look for recognizable names and think of the people laid to rest. I think of the guys who sculpted the stone, notice how it ages, why some is mossy and some clean. I wonder if the stone was positioned on the base with ice cubes to eliminate the friction, slid into place, then, as the ice melts, it settles into just the right spot - or maybe shoved with a crowbar on sandy slats of wood, pried into position, lifted and placed. Did they nick the edges, was the stone centered to the eye or measured and nudged painstakingly - all the procedures to putting it just so. It's a memorial to more than just the corpse, but to the hands that touched it in its making. A guillotine, for granite - most likely a German made machine. These stones are six inches thick, but it can cleave much thicker stone and cuts a "chisel face" surface. This granite slab, weighing over a ton, is lifted onto the cutter's table. Elberton is dotted with old abandoned flooded quarries.